Home » Meetings » Tree Forum » Can’t see the trees for the grass? Can’t see the trees for the grass? 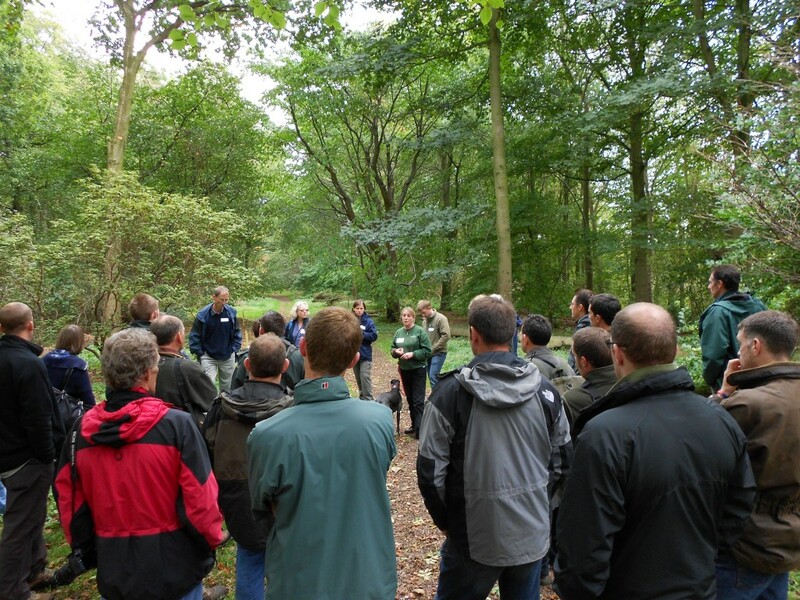 The first meeting of the PlantNetwork Tree Forum was held at Castle Howard Arboretum in 1999, and we were pleased to return to see how it had developed. Planting began in 1975, when the late Lord Howard and Jim Russell shared a vision to create one of the most comprehensive collections of hardy woody plants in Europe. In a walk around the Arboretum with Jan Hoyland (Curator) and Neil Batty (Collections Arborist and Operations Manager), we considered different approaches to grassland management and how to improve access to the collection while reducing reliance on regular mowing. 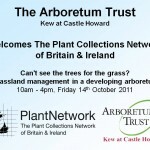 The Arboretum covers approximately 120 acres, and is managed by a mowing regime that keeps the grass short along the main vistas and in clearings and glades, but leaves the grass longer around some groups of trees in ‘beds’. Grass cutting is managed by Neil with some machinery and a small team of volunteers. There was discussion on other ways of maintaining the landscape, with rich and varied habitats to complement the tree collections: leaving some areas of long grass, encouraging the growth of wild flowers in meadow areas (using yellow rattle to reduce soil fertility, rolling out hay bales from a meadow, removing grass mowings). Other aspects discussed were machinery for sward maintenance (ensure it is suitable for your needs by hiring before you buy), mowing paths to manipulate how visitors use the site and take them further into the Arboretum to a ‘destination’ or to highlight vistas. 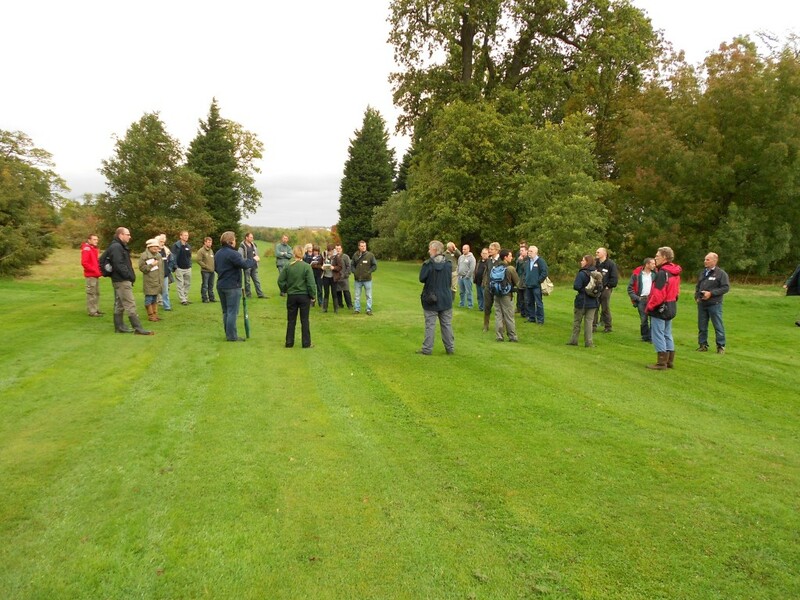 There are long and short tree trails, but many visitors to arboreta simply come for a walk rather than to learn about the trees – how do you get them interested in and excited about the tree collection? Katherine Forsey, Education and Outreach Programme Manager, was very enthusiastic about her work with schoolchildren, teachers and other groups, with the help of volunteers, and on interpreting and using the Arboretum. There are two outdoor classrooms under tents, a straw-bale bird observatory with one-way glass, a wildwood discovery zone and lots of workshops, activities and special events. Over in Ray Wood, we saw how recent management (pruning and removal of some trees by contractors) had opened up the canopy and thinned out the understorey, letting in light so that the collection of rhododendrons (some 500 species and 300 hybrids), and other rare trees and shrubs will thrive again. The 40-acre woodland had been clear-felled and reforested with hardwoods in 1948. New planting began in 1968, when the historic collection at Sunningdale Nursery was transported to Ray Wood. Now, many volunteers are helping with the restoration and maintenance on the ground.